Welcome to my family history homepage! Here you will find a brief summary of the lives of my ancestors, and links to expand their stories where available. The main names also appear in the index to the left. There is also a site map showing all pages , and a site search page powered by my favourite search engine - 'Duck Duck Go'. This site has grown over the years, and become over-complicated, so I am gradually tidying it up. The pages I have updated will look similar to this, so If you have any problems with an updated page please give it a second chance, then let me know the problem. I am researching names connected with my family - so far the most interesting group has been the CHEESMAN family in the Brighton area of Sussex- not all are related of course, but they make up the vast majority of the three hundred-plus names on file so far! Out of respect for my family's privacy, all specific family references will end at 1900. however, I will allow more recent references to some of the more illustrious people. My Auntie Gertie and her two sons Harry and Wilfred were regular visitors to my grandmother when I was growing up, but I lost contact with them in my teens. I have now revisited their story, and given them their own page. The line I have traced so far starts with John. In the baptism records at Brighton, Sussex,for September 1767 he was quoted as 'John Cheesman, baseborn son of Barbara Children'. This wording probably indicates a reference to someone called Cheesman, but I it would be no more than a guess that this was the name of the father. However, Barbara seems to have come from a desperately poor family, receiving support under the poor law. John could not have succeeded in life as he did without a good education and at least some money. John, although base born, went on to father a dozen children, and died in 1823 making provision for his family in a will which includes several houses and tracts of land. He was certainly 'in the right place at the right time' as the patronage of George IV led to the expansion of Brighton, but it seems likely that he started out at least with a good education and some money behind him. Perhaps his father - Cheesman? - was from a good family - perhaps Barbara was a servant? This would fit the facts, but is currently no more than supposition. Perhaps he was one of the younger sons of the Shoreham Cheesman family, but records are incomplete and I have found nothing to confirm this other than a hunch. There was also an Edward Cheesman living in Brighton in 1799. John's first son John died as an infant, but his next son, also John, prospered. This John also made a will, having apparently invested his money. Some of the family were to prosper, but sadly my direct line shows very limited signs of affluence! From 1791 to 1799 the children of the family were Christened at 'North Street Duchess of Huntingdon's or dissenting Protestants' Church in Brighton. Before and after this flirtation the family church was St. Nicholas, Brighton. The new workhouse built in 1822 was the work of a John Cheeseman, presumed to be one of our Johns, and a John Cheeseman was awarded the contract to 'scavenge' (clean the streets - a valuable source of manure) in 1818. However, there were complaints, and he lost the contract! George, the third son, known as George the elder, was a master builder, trading with his son Charles as George Cheesman and sons, and they were both very involved in the business life of Brighton. Cornelius my great-great-great grandfather, was the seventh born, in probably 1801, and referred to himself as 'CHEESMAN CHILDENS': this incorporation of the name CHILDENS or CHILDRENS in various forms continued into living memory, although nobody in the family knew of its origins. He married Mary Maria DYMOCK by licence. This could possibly indicate that the family were Catholics. however, the next generation were married in St. Nicholas' (Church of England) Church by banns. His descendants have suggested that at some stage the family were Catholics. More below. This line of the family also tends to add a central 'E' into the surname, which probably indicates nothing more than the fact that they weren't very literate. This page was one of the first I published when I started looking into my family history. One puzzle was how my first Cornelius ancestor established a place as one of the more visible members of the family, and then seemed to be sidelined. I have now found that he was declared bankrupt in November 1825. In January 1826 the records show that one of his brothers (I can't find out which one) offered to 'supercede' the bankruptcy, offering creditors seven shillings in the pound on condition that all Cornelius' estate and effects were made out to him. Until I find out more I cannot tell whether this was a generous offer to uphold the good name of the family or a predatory strike. The next Cornelius was born in 1823. I have only found one sibling - an older sister, Mary Maria. By trade he was a carpenter - a tradition which continued to the next generation. 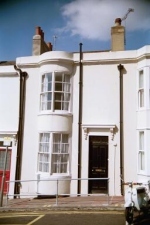 In 1851 he lived at 18, Regent Street, in the centre of Brighton (pictured left), with his wife Mary Ann, and sons Cornelius and William, and daughter Mary Ann, along with the Piper family. The third Cornelius was born in 1844. In the 1881 census he was recorded as a journeyman carpenter, living at 22, Cheapside, Brighton. I now have definite information about this line the family converting to Catholicism - click here for more information. My grandfather, the fourth Cornelius, was born in 1870, the third of ten (the first son was named George). He worked as a merchant seaman all his working life. From about 1915 to 1940 he was a steward on the Union-Castle Line 'Edinburgh Castle', sailing between Southampton and South Africa via Madeira. This probably explains the fact that he doesn't seem to be in UK records in his early years. Cornelius enjoyed the life and hated it when he was eventually forced to retire. One of the few inherited items in the family is the sailor's chest his father made for him to take to sea. It is simple, but expertly crafted. Another is an EPNS eggcup bearing the 'Union-Castle' crest. Was it from the First Class restaurant? My guess is that he helped himself to it as a retirement souvenir! I have added a page dedicated to my grandfather Cornelius and his ancestors - it includes a photograph of the eggcup!. There is now a thriving American Cheesman line. They have their own pages. Apart from the American connection the only known ancestor of mine known to have emigrated was a brother of Cornelius, who would have been born around 1870, and according to family memories, emigrated to Australia but died young. I have heard froma contact that there was a Reginald born about 1888, who was a railway locomotive fireman in Perth and a private in the Australian Imperial forces, who died back in Brighton in 1917. My grandfather had two daughters, May and Vera, my mother. Sadly, both have now passed away and my branch of the name is no more. The earliest ancestors I have traced with any certainty are George and Arabella CHILDRENS. They lived in the Hartfield area (East of Gatwick, in Sussex), and would have been born at the beginning of the 18th century, having seven children between 1729 and 1747. Barbara was the fourth, born in 1736. In 1742 the family are recorded as living in Hartfield, but supported by East Grinstead Parish under the Poorlaw. Barbara was 31 when her son John was baptised in 1767. So far I can only conjecture on the identity of the father, and the source of the given name CHEESMAN. Barbara's son John, despite his very lowly birth, was the centre of a large and successful family. Apparently well educated, and quite wealthy, he tended to record his children's surname as 'CHEESMAN CHILDENS'. In later generations the name CHEESMAN dominated, with or without a central 'E', but with the last forename recorded as Childrens. My great-grandfather, Edward Hoare, married Angelina CRUX in 1875. Until recently I had done little work on her line, although the name was clearly uncommon. I have now been contacted by Michael Crux who has not only traced the family back with some certainty to 1439, but has published a book 'Living in Kent, a family history'. The book mentions Angelina, and includes a delightful picture of the mill in Kent where the family lived. She was born in 1840, one of four daughters of Henry CRUX, born before 1824. I have added a page for the Crux family. I know little about Elizabeth Eliff, but I have a sneaky feeling that she is interesting! She was born around 1788 in Godstone, where her family leased Flint Hall and ran Flint Hall farm. She married Edward Hoare at Saint Bride's Church Fleet Street in London in 1812. She lived at Chaldon Court until 1878, outliving Edward by some eighteen years. Can you tell me about her? Ann Flyger, born 1819, was the daughter of John Flyger. She married John William Williams in 1843. Her younger brother William Henry Flyger emigrated to New Zealand, where his descendants still live. I know from Ancestry DNA testing that I am related to Ann because of my match to her father John. My mother and my dad's wedding photograph is at the top of this page. 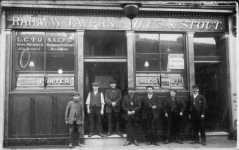 My grandmother recounted two aspects of the HOARE family- first, we were descended from East End brewers, second, we were way back related to the HOARE family of bankers, but there was a falling out between the two sides of the family. I have always been sceptical in the extreme, but as I have pushed back through the generations the two possibilites seem more rather than less likely. however, I HAVE NO PROOF! There seemed to be some truth in the first point, in that Edward HOARE (my great grandfather) was recorded as landlord of the Railway Tavern, Deptford, in 1876. In the 1881 census he was recorded as a 'licenced victualler' living at 4, White Cross Place, Shoreditch. By a remarkable happy chance I have been sent a photograph of the Railway Tavern by a descendant of the next landlord. (click here for a more information) I have also found published reference to Hoare's beer in "The Magic of my Youth", by Arthur Calder-Marshall. Sadly, more research seems to have put an end to the idea of my family as brewers - it seems that Hoare's brewery was owned by the bankers, who bought up the old Red Lion brewery in the mid 1800s. Their logo was the Toby jug, which was kept on by Charringtons when they eventually bought the brewery and incorporated it into their chain, and is still in use. The connection to the most famous bankers in British history looked unlikely to be true. My grandfather was Edward Henry, born 1876. In the HOARE bankers family there is an Edward Henry born 1872. Close, but not close enough! In fact, the name 'Edward Hoare' has now been in my family for eight generations. The first I have traced was born about 1760, in Chiddingstone. In 1812 his son Edward was married to Elizabeth Eliffe in St. Bride's Church, Fleet Street, London - a church with connections to the bankers. The next Edward was born in 1816 in Merstham, Surrey, and married Emily TYDY (spelling varies). At this time they were apparently farmers. The family seemed to be at the centre of village and church affairs; I know that three generations of the Hoare bankers family were rectors of Godstone, but I can't (yet!) find any connection. 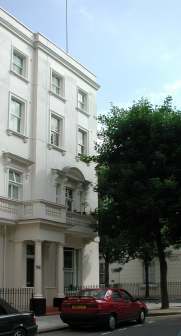 By 1901, Edward Henry the erstwhile brewer, was living in a large house in Pimlico (pictured right), occupation 'dealer in works of art'. The 1901 census shows that he had one servant, and apparently only owned part of the house - however, a grander life than running a pub! I have after many years traced the family back further, and written their page. In 1864 my great-grandfather, Cornelius CHEESMAN married Hariett Sarah HOLLAND. She was the daughter of William (Spencer?) HOLLAND and Emma DAVIES, who married in 1844. The Keld family are descended from William KELD, born 1801 in Headon, Yorkshire a gardener by trade. His descendants were seamen based in Hull, and later London (as lightermen) and then Portsmouth. There are currently a large number of descendants of Ernest John KELD and Elsie SNAZELL, born at the turn of the century, who had nine children. Elsie passed away in 1999, and by an ironic twist of fate this line of the name will probably die out within a generation. I would love to know more about Mary KITCHENER, who apparently was born in 1766, and died in 1822 in Brighton, having the married the 'baseborn' John CHEESMAN, mothered twelve children, and seen him rise to a position of considerable wealth. First, an Ancestry DNA test and some digging into the records revealed that I am related to Air Vice-Marshal Maxwell Edmund Massy Perkins. Elsie Snazell, born 1897 in Portsmouth, who married Ernest John Keld, has one of the least common names I have encountered, which makes research easier. Elsie's line currently goes back to Ambrose SNAZELL, born 1836. The family originates around Essex and Suffolk. My maternal grandmother's name was Eleanor Florence WILLIAMS - not the easiest surname to trace! She was born in 1877 and her father was John Dalby WILLIAMS, a Thames lighterman. John died in 1882 when she was only five. Family recollections suggest that neither she nor her elder sister Harriett (sometimes recorded as Henrietta or Hettie) were happy with their mothers next partner, and at one stage they were brought up in the Gun Hotel on Wapping old Stairs by her father's younger brother Dalby. In reality the story is much more complicated, so she now has her own page. According to the census by 1891 she was an inmate in the Ilford girls village home for Orphan Neglected and Destitute Girls. Further research has revealed that this was what we now know as a Barnardos home. This charity is still around and doing good work, and they have an extensive archive which has helped me cover her early life in great detail. Eleanor's uncle Dalby WILLIAMS was elected as LCC (London County Council) councillor for Tower Hamlets in 1895 representing the Moderate party (allied to the Conservatives). The family have spoken of a photograph of him kneeling before King Edward VII. Searching IGI records for Dalby/Dolby, John, and Henrietta WILLIAMS turns up entries in St. Dunstan's, Stepney, going back to 1643, and as if that weren't enough, in 1811 a John Williams murdered seven people before committing suicide in Wapping on the eve of his trial. Am I descended from a mass murderer? It is just possible that I am descended from the man accused of being a mass murderer, but was he guilty? You decide!